I woke up yesterday morning curled up into a ball of deep heaving tears. As I sit to write this I realize today marks exactly 6 months since our father was identified as certifiably dead. Not exactly the easiest or best way to put it, but flat out, it isn’t the day he died, it is the day they identified him as dead. However, I didn’t wake up crying because of the anniversary, but rather the last moments of a very active and visceral dream I’d been having with him. I have not dreamed of my father up until now. We were traveling around, as if we were doing errands; shopping, collecting things and shoving items into a vehicle we were in. I vaguely remember my mother being along for all this, nagging her Pito about the things we were collecting. I remember struggling to get some things in, and when pulling things out of the back, feeling as if there was no way we could get all that stuff back in there again. Also my father, in a way that felt like a playful joke, had written on the back of my calves while I was driving, a model number and serial number for something. I recall not having my glasses to clearly see the numbers. We were not “home” but it felt as if we were staying in some transitionary space. My father opens a door to a “bedroom” and says, “I’ve got some things to get down about the cars, then I am going to bed.” I suddenly feel as if this is my only chance so I tell him, “I have something to talk to you about,” and I follow him in. I feel anxious and timid about even approaching what I am there to talk to him about. He sits at a computer running through an application and asks to see my calves. The serial numbers I feel are related to the Jag. As the program runs, a document is created on the screen and there are signatures inscribed on “sign here” lines; the name Julie something is signed, like a Jane Doe sample, on numerous pages. “Pa, it’s a huge fiscal responsibility!” I can hear my exasperation with him, and he is looking at me with similar sentiment. “How is that even practical? It’s not like I can make it my primary car, Pa!” For a moment, his face changes as he recognizes that this is so powerfully true. Our eyes meet and I can feel all my guilt and fear well up in me about both his most prized possession AND my responsibility for it. I quiver like a child, like his daughter coming for reassurance. “You won’t be mad at me if we decide to sell it?” I ask as I begin to feel my lip quiver in the vast space he holds. Tears come as he opens his big arms, and I fall into the crick of his shoulder and neck. I can feel his grey whiskers against my neck, and I can smell his Pito smell, and he holds me in a big embrace as I weep against him. I wake up, crying. I can’t tell which is real for a few moments, so I keep my eyes closed and cry into the dream as best I can, for as long as I can, because I miss him. I’m afraid I will forget his smell, the way his hugs feel, and the warmth of his body when he has held me close. 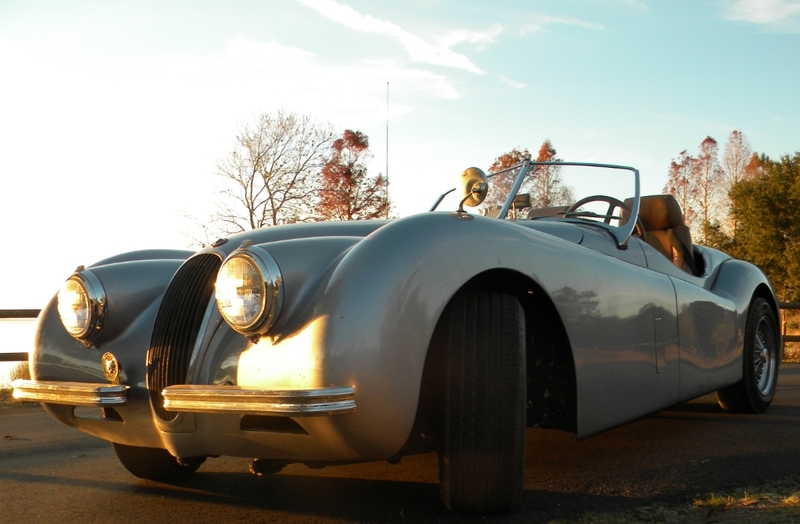 The 1952 Jaguar XK120 Roadster has been really hard to figure out. None of us kids really want the responsibility of it, it’s just too much “car”. So, my heart has ached about letting go of it, while knowing there really isn’t a lot we can do to make it financially easy to keep. Storing it, the mechanics, gasoline, INSURANCE! It’s a huge fiscal responsibility. It will sit in a garage again like it had, and that Roadster really wants to be screaming along roads, roaring and showing itself off. Our father knew that car intimately, involved in every aspect of its renovation. Additionally, he has had it since he was 19, purchasing it from his brother who owned it briefly after acquiring it from the original owner. 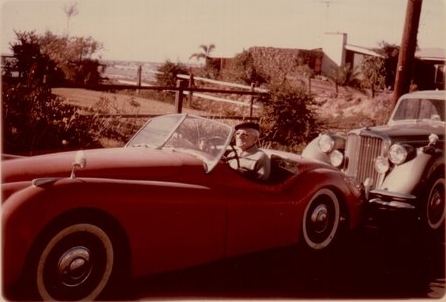 We have a picture of our Great Grandfather sitting in that Jag. I have faint memories of riding with him in that vehicle down the highway in San Diego when I was young. When he got his dream job in New York, the Jaguar was the last thing they carefully packed in the moving van, and the first thing out. After years degrading in his basement in NY, it was again packaged for its trip to Florida after his retirement, and he started the slow and arduous process of bringing it back to life. Although he never quite shared her name with me, I call it a Jaguarstien, and amalgamation of old and new, and the brainchild of his own hobbyistic “secretly wild-boy” enthusiasm. There have been a few changes to the beast that us kids have cringed at, and one in particular that he never finished (thank god!) after my sneering disapproval (I’d like to think I am responsible for the prevention of foreign headrests). Regardless of the purity of his Jag, he joined the Jag club, and I began to attend Jag Rallys, Jag breakfasts, Jag parties, and Jag crawls (though I think they call them “prowls”) because of the length of time getting from point A to point B on any given afternoon among a caravan of enthusiasts. We took pictures of his treasure, and I became part of a tender group of people who were quick to enjoy our father’s humor and playfulness. The Jag club even made a special award for him, and by the last year or two of his life, he was the active Badge Master, assuring that everyone had their name tags, and brought them to events. He worked to help at every event, and at his “happy hour” celebration, his friends arrived to celebrate him and present an award for being the most involved member (that story has a funny edge to it too!) I am known by the club, and I could never express the depth of gratitude for their arrival during our grief and the loss of our father. Every event was on his calendar (that he kept shared with me, so I also know about appointments, spa day for Gizmo, trash day, target Tuesday, and other regularly scheduled events). My favorite thing however, was to ride shotgun with Pa when I would visit. Sure, I attended events and enjoyed the socializing. I loved that I was his date for every January Holiday party with the Jag club. However, he had a sort of zen energy when we took those back road trips, much like we did when I was a teenager. As my hair whipped around my face, and all the grit from the joints and wing vents pelted me on a ride, I would feign the terror of being on a death ride with him. However, inside both of us would be beaming. THIS is one of the ways I could connect with my father. I would joke that I went around with him just so I could be the “eye candy” for all the goats who had to stare at us on the road. He relished that car. So I think the conversation with him was really to get him to understand, or for HIM to get ME to understand. Our brains are amazing… that conversation was really so succinct and EXACTLY what I needed. It felt so clearly of him, even when at first I recognized that he didn’t like the idea… then as it made sense he assured me with a big hug that none of his love was wrapped into his feelings for the Jag. The Jag, it was just a vehicle to help us on this plane to connect with each other when he was alive. And this is so important, because NONE of his LOVE is wrapped up in any of the things left behind, but rather in the space in which he holds each of us, and we him, and the ways in which we know each others hearts. His love beats though my blood vessels every moment, and his pride shines from my smile, and his being is all that I am, and more. I honor him when I continue to grow in the world, when I shine my light on others, when I love and live as big and brilliantly as possible. And, that hug, falling into his weight and warmth, just his daughter, just my father, was a reminder that all we have is love. Wonderful writing – and wonderful story. To me, it sounds like you had not a ‘dream’ but a clear ‘visitation’ – a connection from beyond. The veil between this world and the next is so very thin – it’s just that most of us are too busy or ‘non-believers’ and never get the chance to experience a visit from a loved one. I knew exactly what you meant by ‘I could smell him, feel his whiskers, hear his voice – but it’s the LOVE you feel that ‘space’ between you that is filled – and it’s such a relief to know the person you love – their soul – is still there with you and is still supporting you – no longer in a ‘physical’ way, but in a spiritual way. Thank you, dear Evelyn, for sending this loving missive to me. I enjoyed reading it and the memories it evoked. Your dad was a much admired, much loved person and it is wonderful to read how much you valued him when he was alive…much more important to value the living and show them, let them know, how much they are loved. Some of us never get that chance and some get it and don’t know enough to use it. I hate for you to let go of that car, the car your father prized and loved so well… but he enjoyed it and if you cannot, it would be time to let someone else enjoy and love it. I wish I could but I have known for years, even though I now have the means to afford a foreign sports car, that I don’t have the proper place for one nor the time to enjoy it as only a true sports car enthusiast can and would. I hope I can come visit while you still have your Jag. I would love to take one ride with you and see you smile….